Are you juggling too many responsibilities? Are you overwhelmed with all the different aspects of your business? 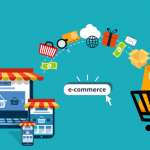 As an eCommerce entrepreneur, the challenges of design, marketing, analytics, content management, production, and customer service can become too overwhelming! In order to streamline these processes, there are a variety of tools that you can make use of. They can be of great help in improving your productivity and scaling your business. 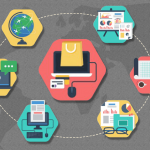 With time, the eCommerce industry has reached a point of immense competition in the market. And there are a lot of tools to choose from. Some of them outplay the pack and are a must have for your online business. Viewport Resizer is an essential free tool for fast testing. You can test the responsiveness of a website with the click of a button. It allows you to save a bookmarklet on your web browser which can render your target website to different screen sizes. It is a free tool maintained through customer donations and contributions. You don’t have to load your site on an actual device every time. 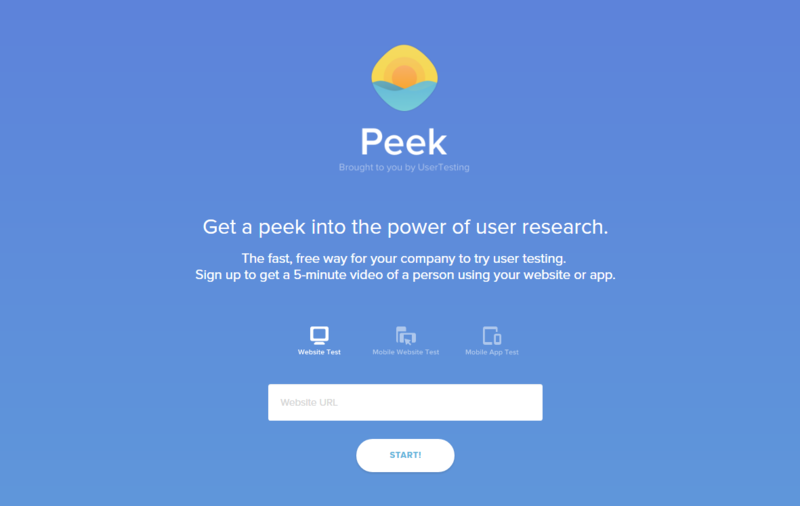 Peek is a usability testing website where you can request an anonymous user to use your site and record a video. Basic Package – $49 per video till 10 videos ($99 per video after that) with 15 min long videos. Pro Package for advanced testing – This is an enterprise plan for individual contracts with 60 min long videos. Even with meticulous attention to details, it is not possible to predict how users will behave when interacting with a site. So, this kind of testing can provide the valuable feedback that will help you tweak and optimize your site. With Canva, you can create images and graphics for social media ads, blogs, giveaways, posters, and more. Free usage includes 2 folders to organize design, 10 team members, and 1 GB of storage for uploaded photos. You can also buy photos from Canva for $1 each. With Canva For Work, you get unlimited folders, 50 team members, and unlimited storage. Canva For Work is $12.95/user/month. 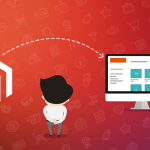 Marketing is the part and parcel of an eCommerce business and Canva is a great help. If you are creative, and you don’t have technical design knowledge, Canva is the most useful tool for you. Are you struggling to come up with interesting titles? Tweak Your Biz makes it easy for you. Enter your topic keywords and click. It will generate hundreds of titles for you. Free of cost with no restrictions on use. It makes it easier to pinpoint the area you want your content marketing to concentrate on. This tool also divides the titles into subtopics. LetsClap chat bots help you fulfill your repetitive customer requests. These bots can complete tasks like data entry or automated replies. They can save time and money. You can get a 14-day free trial. Great customer service is an important aspect of maintaining a nurturing relationship with your clients. However, it is expensive to maintain a 24/7 service. Also, there are repetitive tasks that don’t require human intervention. LetsClap saves you from the hassle. It can take your high-quality JPG, PNG, GIF, and SVG files and compress them without almost any loss to the quality of the images. Just upload an image and discover the change! This free tool is easy to use and is a great time saver. Compressor.io is a life saver. Lossy compression can be applied to all file formats, but you can also apply lossless compression on JPG and PNG files. Image sizes can drastically slow down your eCommerce site. SmartMail offers a complete email marketing solution which is a combination of platform and services. 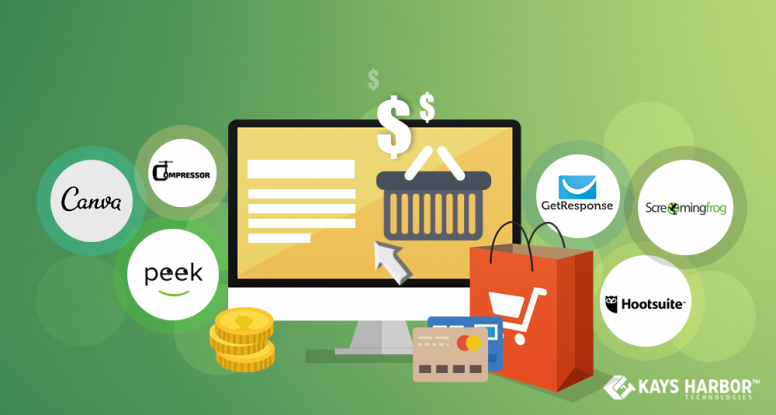 They take care of data integration hassles, responsive template designing, automation and realtime reporting for your ecommerce business. You don’t have to worry figuring out how to execute your email marketing plans. 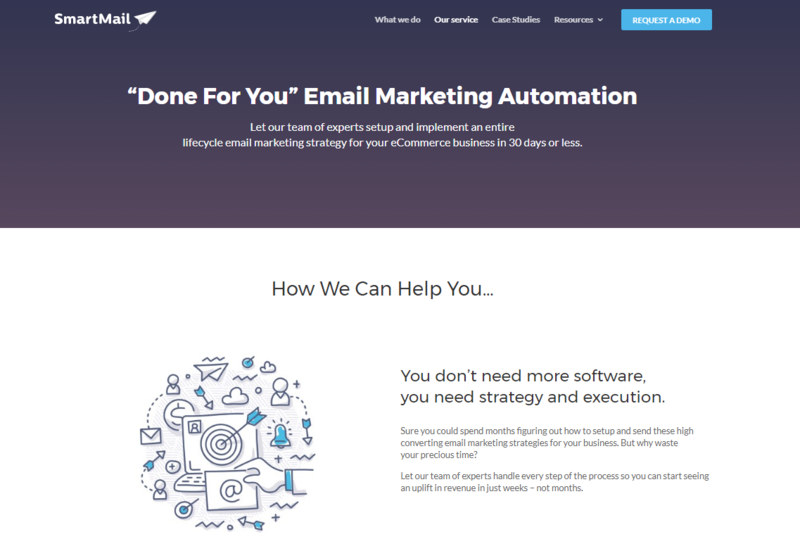 They help reduce your developer costs by providing full setup for your email marketing integration process in just 30 days or less! Screaming Frog’s SEO Spider Tool is a web crawler that can help you analyze your target website’s SEO status. It can find duplicate product page titles, metadata, 404s, and more. It runs SEO audits on whole sites. You can download and use the tool for free. The free version is limited to 500 URLs. The paid version has unlimited crawls with more advanced analytics. It costs around $180/year to get a single license. There are discounts available for multiple licenses. Screaming frog is the best tool to run SEO audits on whole sites. It works best for on-page optimization and broken-link building strategies. Search Console allows you to find out if your website is getting recognized by Google properly. You can analyze the clicks from Google Search and determine where you can optimize. Google Analytics is an extensive tool to analyze how your site is performing in terms of clicks and conversions. You can design your ideal outcome and compare the behavior of your visitors to that outcome and tweak your site. 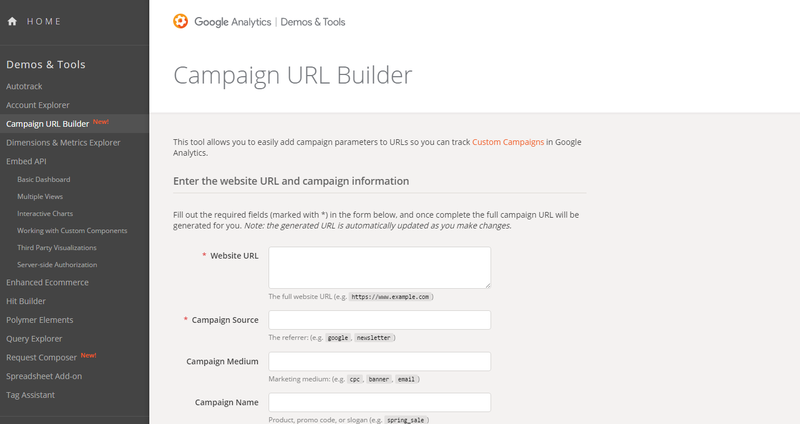 This tool allows you to create URLs with parameters to track your Ad campaign performance. 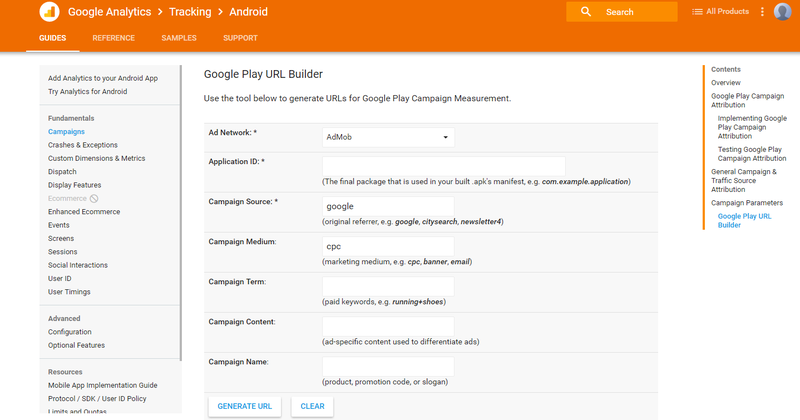 This tool does the same thing as above but for mobile devices and Google Play campaigns. Keyword Planner helps find the best keyword to target the desired audiences. 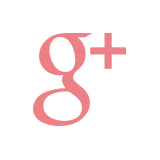 You will need an AdWords account to access this free tool. GTMetrix measures your page speed and load times. After you enter your URL, it analyzes your site and gives it a PageSpeed score and YSlow score. Basic tier is free to use with 3 URLs. Bronze tier – It starts at $14.95/month with 10 monitored URLs. Gold tier – It allows 50 monitored URLs for $149.95/month. It also gives a breakdown of different components tested during the analysis. It can help you recognize the slow components of your site and improve on it. Hootsuite brings all your social media marketing to one single dashboard. You can schedule your blog posts, tweets, Linkedin posts, Facebook shares and much more. It also provides advanced analytics for every social account. 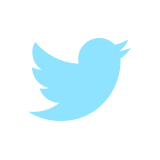 It also helps in monitoring custom lists and feeds on social accounts at one place. 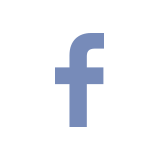 Free Tier – It allows 3 social profiles for 1 user. 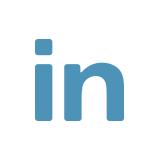 Professional tier – It allows 10 social profiles for 1 user and costs $19.99/month. Team tier – It allows 20 social profiles for 3 users and costs 104.97/month. Business tier – It allows 50 social profiles for 4-5 users and costs $399.99/month. Enterprise tier – It allows custom pricing and benefits. Hootsuite is a great tool to organize your marketing campaigns. You can engage with your audience from different networks from one command center. Optinmonster provides options for eCommerce retargeting, opt-ins, coupons, and landing pages. Although there are several competitors in this domain but this tool provides better value for the money. Basic Plan – It starts at $9/month. Pro Plan – It starts at $29/month. 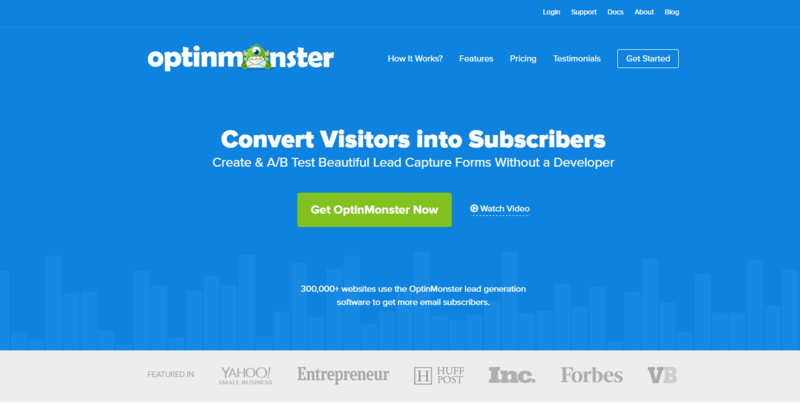 If you are looking for more conversions in terms of blog subscriptions or sales, Optimonster is an easy to use lead generation software with built-in analytics and page level targeting. We have brought together some of the most useful tools we could find. Are you using an amazing tool that we missed on this list? Please feel free to share it with us in the comment section!